I used an IKEA Ribba frame, with an 8x10 inch matting cut to fit it...so that's the space I was aiming to fill...with fabric peeking around the edge of a 8.5 x 6.5 inch piece of paper. 1. Pick a favourite sketch-like font and centre it in an 8.5 x 6.5 inch text box, allowing space for the feature words. 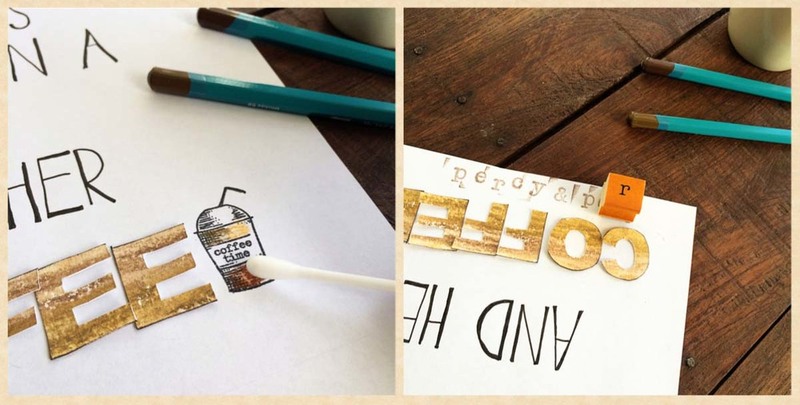 Once you've laid out the sketch font, switch the font colour to a pale grey so when it prints, you can just see it. This font is Paris...Tall `n Skinny by A Beautiful Mess would work well too...you just need it to be thin enough to write over the top of it with a felt tipped pen. 2. 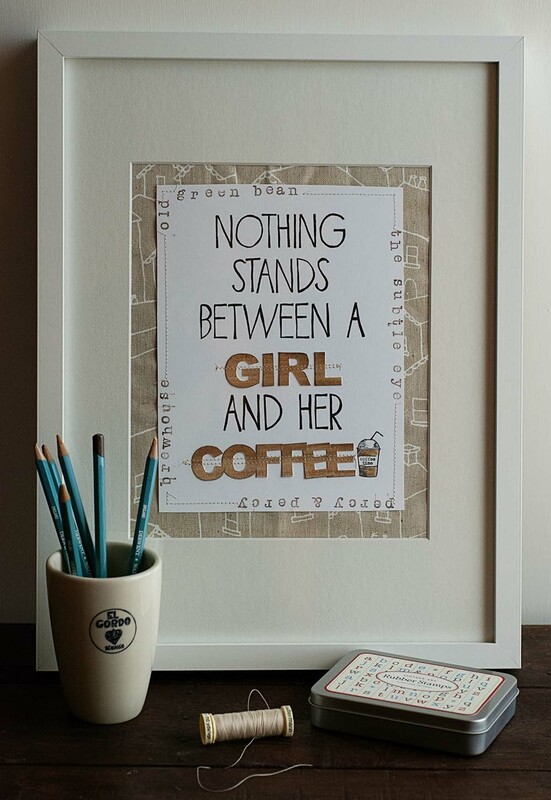 For the feature words, in my case GIRL & COFFEE, pick a chubby font that's going to be easy to cut out by hand with a craft knife. This font is Arial Black. Size the letters so they fit in the spaces left for them...and then move them to their own page in preparation for printing. 3. Flip the text frames horizontally so the words are backwards on the screen (so when you're ready to cut they will be the right way around). Some printers have printing in reverse as one of the options in the printing preferences. Change the colour of the letters to medium grey. Print both pages. My paper of choice is Canson Colourline A4 220GSM in white from Arthouse Direct (local & online). I like that it has a subtle texture, works well with water colour pencils...but is also a good mainstream card for whatever project you're working on. 4. Trace the letters of the main phrase with black fine liner...0.8 in this range is my favourite :) Write over the letters enough that no grey is peeking out from underneath...and then I like to mess with them a little bit...adding thickness to parts of the letter here and there. I like that it looks a bit more hand lettered...and it also doesn't matter if you're a wobbly tracer like me...it all contributes to the overall look I think! 5. Select a few tones of whatever colour/medium you'd like to work with. I picked three brown water colour pencils which you should be able to pick up individually from art supply stores. Have some earbuds (or a brush) and a little container of water at the ready. Turn the feature words paper so the words are face down so you are colouring on the back. 6. I just do some random scribbles of each of the different shades...so long as there are no white forgotten bits when you go to cut the letters out. 7. Dip the earbuds into the water and then paint across the pencil lines to turn them into water colour. Make sure there's some overlap and blending. Wait for water colour to dry. 9. I inked the outside edges of my letters with a dark brown (aka Pine Cone) Versa Colour ink....just by kind've rolling and pressing them into the ink pad...if you angle the letters towards you slightly whilst pressing down, you'll get some extra ink showing on the front side. 10. 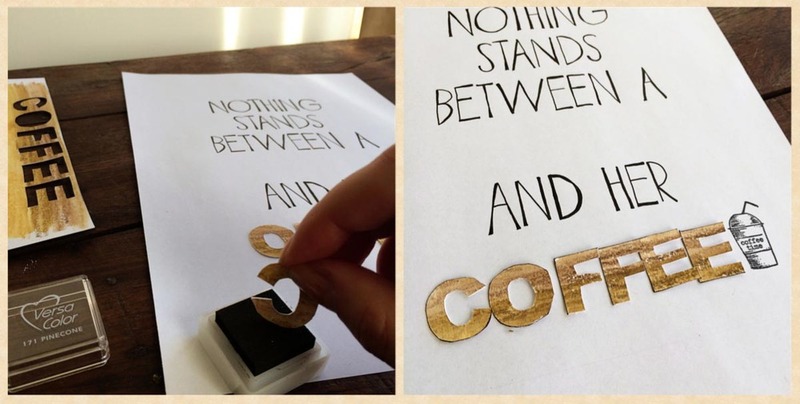 Stick the letters down using teensy pieces of double sided tape. I like to overlap mine slightly here and there, a few of them are tilted a little bit...just to get an uneven look. I found a cute little `coffee time' stamp in my collection...so I stamped that in black. I couldn't find a link to the stamp online (it came in a Studio Calico kit) but tea and coffee stamps seem to come up a fair bit...even on Etsy. 11. Used the same water colour pencils to colour in the stamp and a little bit of water to soften/blend the colours. 12. Now is the time to cut the paper to size...roughly 8.5 x 6.5 inch for this one...so you know where the actual edges of your paper are going to be. Then, at random intervals around the edge I stamped some of the names of my favourite local cafes with a typewriter style stamp (from Organise My) in the same dark brown ink. I'm not worried if the edges of the stamp show up along with the letter...I like the haphazard look it gives...plus wooden stamps are hard to space evenly anyway so I figure haphazard is the way to go here. Leave plenty of space between them for stitching the border. When I'm done with the stamps, I clean them with fragrance/alcohol free baby wipes...I read somewhere once this is pretty gentle on the stamp surface. 13. Lastly...stitching. 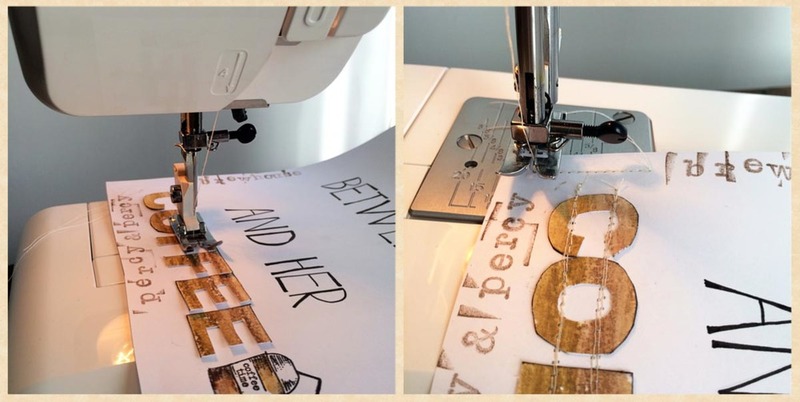 I did a few rows of stitching to hold the feature words COFFEE and GIRL down...using a neutral thread. 14. Then I stitched around the edges of the page...stopping and starting either side of the cafe names. If you want to create a nice sharp corner...stop the sewing machine when the needle is through the paper...then lift the foot and spin the paper...and lower the foot again to keep going on the new edge. 15. You're pretty much done! I laid my frame face down with the matting already in...then I placed the paper print you've just made in the centre of the glass...then I laid some material behind that so it shows around the edges...then put the back of the frame together again. I picked a neutral linen type material...didn't care that it wasn't ironed...I like the dimension/shadows that the wrinkles create...it reminds me a little bit of the burlap coffee bags! This fabric is from Ink & Spindle.